Thanks to everyone for their kind words and support about my "repurposing vintage needlework" post. It was great to hear from so many of you and I really would love to see if you decide to make your own pillow or mini quilt from discarded or sentimental needlework pieces. For that post, I forgot to include a mini quilt I had made with the same idea. This piece of embroidery was found at an estate sale for about 50 cents. I think the black word on the bottom right is the name "Dawn." I decided to frame it with scraps and this was the March entry I submitted for Scraptastic Tuesday through Instagram. For April's submission, I'd like to share a recent scrap busting endeavor I decided to start as a "leaders and enders" project. 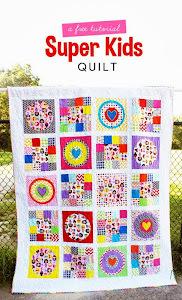 I loved a scrappy quilt Nettie shared on her blog in February. She shared the dimensions she used and I decided to cut a bunch of these squares and rectangles from my scraps. I've put them in a tray by my sewing machine and when it works out, I sew them before and after other projects- this way, it will get done without me devoting a TON of time to it (hopefully). I am not sure if I really love the results so far though, maybe my fabrics are too busy or maybe it will look better as a whole rather than in parts. I truly do admire other quilters who seem to put together any and all kinds of scraps to make such gorgeous creations. So far, when I've made things out of scraps, I've stuck to specific color palettes and that's been the approach I've been more comfortable with. I'm excited to give this "anything and everything" method a try. 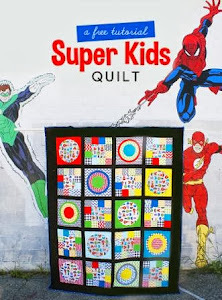 Linking up to Scraptastic Tuesday for April at She Can Quilt. Aww, she looks so cute in that dress and the venue you have chosen for the Easter Party is quite unique and amazing too. Such a wonderful share and great idea of venue are given.